The Treasure Tour blog gives and gives. We share stories about pieces on display, we remind you that you should come to visit us on Thursdays, Fridays and Saturdays for General Admission and, when you get restless on the four days each week we're only open for Group Tours, we encourage you to visit other cool places around the United States. And let's be realistic - there are thousands of them! 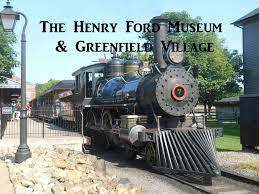 Today, we recommend taking a quick jaunt out to Dearborn, Michigan, and three fascinating sites in one, affectionately called The Henry Ford.